I was raised in the Methodist faith in a small town in North Carolina. The only Catholic Church in town was a block away from my house and a large brick home which served as a convent was just around the corner. I would often see the nuns, dressed in their habits, walking to the Catholic school which adjoined the church. Whenever I saw them, I felt a great sense of respect. I considered them to be very holy, although I knew nothing about the Catholic faith. When I was twelve years old, I heard our pastor state in a homily that in the “end days” most people would turn away from Jesus and become “worldly” — following the antichrist, who he explained was the devil. I don’t recall the devil being mentioned very often in our church and so this statement immediately got my attention. I was perplexed; I couldn’t imagine people turning away from Jesus and following the devil. This was very upsetting to me so I made a promise to God that I would never do that – no matter what everyone else did. I pledged never to turn away from Him and certainly to never follow the antichrist! I obviously didn’t realize what it meant to become worldly and consequently just three years later at age fifteen, I was already headed in that direction. Gradually, Jesus was replaced by someone more important to me – myself. Like most teenagers, I had become self-centered, materialistic, and absorbed in the ways of the world, i.e., worldly. It was when I was fifteen that a strong storm slammed the shores of the Outer Banks which was just an hour’s drive from us. It was reported that many houses that were on the beachfront were demolished by the high waves and strong winds and that nearby Jockey’s Ridge (the largest sand dune in the eastern United States) was littered with broken furniture and household items. I knew several families who owned property there and it so happened that the next day at school, one of those friends invited me to go with her family to their beach house the following weekend. They had gotten reports from others in the area that their house was not damaged due to the fact that it was further from the ocean but they wanted to go and check things out for themselves. I didn’t get many opportunities to spend much time at the beach and so it was with great excitement that I rushed home to ask permission that day. My mother reminded me that it was Mother’s Day weekend, but knowing how much this meant to me, she consented. It was to be the first Mother’s Day I had ever spent away from my mother and I knew that saddened her, but I was too excited to think about that; all I could think about was myself. We decided to spend our last day at the beach, which was Mother’s Day, climbing Jockey’s Ridge and seeing for ourselves what was there. As we were trudging up the dune, our feet sinking deep into the soft sand, something shiny caught my eye. I picked it up, looked at it and although it had an inscription on it, it didn’t make any sense to me so I just put it in my pocket. It so happened that I had a new charm bracelet with very few charms on it yet, so I put this new “charm” on my bracelet even though I wasn’t sure just what it was. I’d never seen anything like it but I was intrigued by it. My mother later told me that she thought it was something Catholic, like a St. Christopher “charm”. (Many non-Catholics are only familiar with St. Christopher and/or St. Francis and then only by name). I’ll fast forward now 30 years when I was 45 and at a point in my life when things were at their lowest. I was miserable even though we had just built a new house, thinking that might make me happy. It didn’t. I was finally realizing that material things weren’t the answer I was seeking. Unfortunately, I didn’t even realize I was seeking an answer or even what the question was. I just knew that nothing seemed to make me happy any more. One night when I was at my lowest point, I fell on my knees and prayed for the first time in many years. It was a very short prayer. “Lord,” I said, “I can’t handle my life anymore; I want you to take over my life.” That was all I said and I went to bed. The next morning, I awoke a brand new person. I couldn’t stop talking about Jesus. I was filled with love, peace, and joy. The first thing I did was look for my Bible. I wasn’t really familiar with the Bible, only picking it up occasionally to look for a certain verse to add in a sympathy card or some words of encouragement for a depressed friend. Unlike my Baptist cousins, I was never taught to memorize verses in Scripture nor did I ever attend a Bible study. However, it was truly the Holy Spirit Who led me to the Bible that day because I was supernaturally led to verses that spoke directly to my heart and explained what was happening to me. The very first verse that He led me to was Ezekiel 36:26 where it says “A new heart I will give you and a new spirit I will put within you; and I will remove your heart of stone and give you a heart of flesh.” When I read it, I started crying tears of joy, because I knew that He had done just that. I truly had a new heart. Twenty minutes later, I walked into the Catholic bookstore and then realized that I had no idea what a miraculous medal looked like or how to find it, so I stopped a woman walking by. “Excuse me” I said. “I’m not Catholic and I’m looking for something called a miraculous medal, could you help me?” “Oh,” she said, “Would you be interested in the RCIA?” “What? I….” but before I could even finish speaking she was already rushing off, saying “just a minute; wait right there!” I stood there wondering what in the world had just happened and what she was talking about. “Did she say ROTC?” I wondered. Then she reappeared, handing me a piece of paper saying, “Here’s Sister Barbara’s phone number, I’m sure that….” I interrupted, “Excuse me, but I have no idea what you’re talking about. What is the R…?” “Oh,” she said, “I’m sorry. What I’m trying to say is, would you like to become Catholic?” I couldn’t believe what I was hearing – just twenty minutes ago I had asked the Lord, if he wanted me to be Catholic, to have someone say those exact words to me! I couldn’t get home fast enough to call the number. Sister Barbara answered and I told her why I was calling. “Wonderful,” she said, “We start classes tomorrow night.” “My goodness, Lord, we’re not going to waste any time, are we?” I said to myself. And so I became Catholic. The day I was confirmed was one of happiest days of my life. I felt like a new bride. I cried often: before, during and after my “journey home” – tears of absolute joy, of course. Three years after entering the Church, I was on the phone talking to a friend about my conversion when I remembered finding that Catholic “charm” on the sand dune 33 years earlier. “Hold on a minute,” I said. “I think I still have that charm bracelet here in my jewelry box. I want to look and see what that was that I found that day when I was 15.” I opened my jewelry box and there it was. I returned to the phone, tears running down my face. “I can’t believe it,” I said to my friend, “It’s a Miraculous Medal.” And it truly is a miracle. I was only 15 and I had already forgotten my promise to God, never to leave Him and I was already following the Antichrist in my selfishness, my materialistic goals, following the ways of the world. I had even forsaken my mother on Mother’s Day to pursue my own selfish interests, but my heavenly Mother had not forsaken me. I believe God sent her on that Mother’s Day and that she has been with me throughout all these years, gently guiding me back to Him. It took 30 years and many wrong turns but thanks be to God, I’m finally home! NOTE: Gail has been a speaker at several national Catholic conferences, a guest on EWTN’s Journey Home show with Marcus Grodi, and a featured guest on many Catholic radio shows including Catholic Answers Live, Ave Maria radio: Catholic Connection with Teresa Tomeo, Al Kresta Live and others. 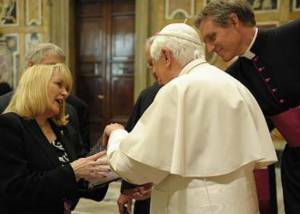 She has also been featured in Envoy and Lay Witness magazines In 2009, Gail was invited to the Vatican for a private audience with Pope Benedict XVI.